Jamie Lieberman joined Mark for a few days of climbing in the Chamonix area. The quick 4 days was only a small part of a multi-month odyssey that Jamie and his wife Andrea were only just starting. Up next on the agenda, intensive Italian language study, then, no doubt, many more adventures. We began our climbing with a warm-up day at Les Gaillands, reviewing systems and techniques (and getting Jamie on his first leads) that we'll need the climbs to come. Unfortunately, I have no photos from our Gaillands session. Oh well. Jamie looking relaxed in Machaby. For day two, we headed to the Col de la Colombiere for some multi-pitch limestone climbing. Here's our route. An enjoyable drive up to the Col. Lovely light in the early morning. Arriving at the base of the route, it's time to rope up. 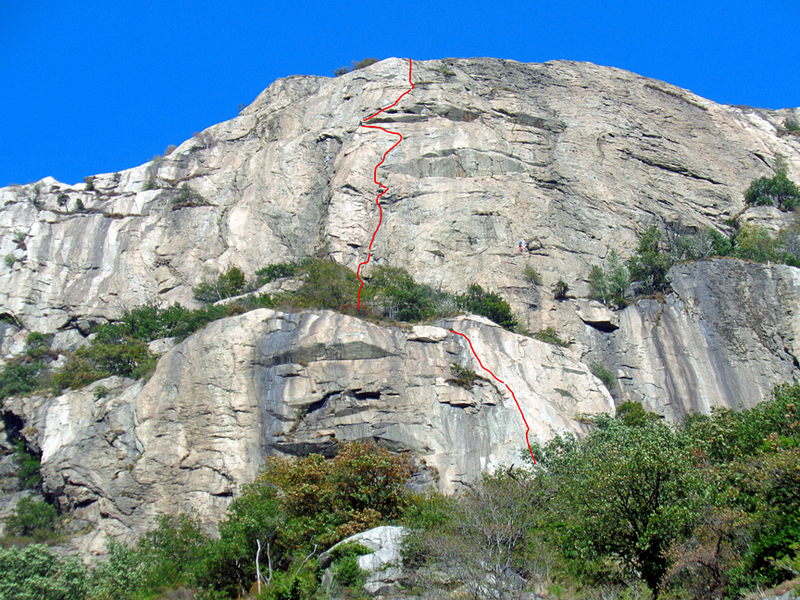 The slabs are interrupted by a strange cable traverse on pitch 3. The angle steepens on the final buttress. On our third day, we travelled into Italy to the Corma di Machaby. Our route of choice is the Diretta al Banano. At the base. Another party starts up. Fortunately, they kindly let us pass on the second pitch. Jamie on the 4th pitch. And the second to last easy pitch. For our last day we took the Skyway lift up to Point Helbronner with the goal of the Traverse of the Aiguille d'Entrèves. Unable to decide what to wear, we brought a selection of shirts and jackets for the day. It did prove difficult to manage the coat rack. In truth, the clothes are not ours. Keep an eye out for street-clothes-in-the-mountains advertising in Italian fashion magazines. At the base of the Southwest Ridge of the Aiguille d'Entrèves, we take off crampons, and start up the rock. It is a long way down to the glacier below. Climbing along the extremely exposed ridge. Most of the climbing is not overly difficult, though there are a few challenging moves here and there. Traversing past the highest summit rocks on our way to the descent route. The final rappel to the glacier and an easy walk back to the lift (and home).